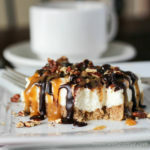 These decadent Pecan Turtle Cheesecake Bars boast a brown sugar pecan crust and light-textured vanilla cheesecake topped with toasted pecans, chocolate fudge and caramel. Unbelievably, this dessert is no-bake, low carb, and sugar free! Prepare the Homemade Low Carb Caramel Sauce and Low Carb Hot Fudge Sauce. They can be made several days before. Alternately, purchase sugar-free caramel sauce and sugar free hot fudge sauce from the store. Preheat oven to 350 and toast all of the pecans (2 cups). Cool. Spray a 9X9 inch square baking pan with baking spray and line with a sheet of parchment long enough so that it over hangs two sides. This will help you remove the bars in 1 large piece for easier cutting and serving. Grind the Sukrin Gold in a coffee grinder and add it to a medium bowl. Grind the pecans in a coffee grinder or in a small food processor and add them to the medium bowl with the sweetener. Add the rest of the dry ingredients and whisk together thoroughly. Melt the butter and mix it into the dry ingredients. The mixture should hold together when squeezed gently in your hand. If not, add 1-2 tablespoons more melted butter. Dump the crust ingredients into the prepared pan and lay a piece of waxed paper over the mixture. Using a flat bottomed glass, very firmly press the mixture into the pan. Wipe out the bowl and add the softened cream cheese. Mix gently with a hand mixer to loosen-up the cream cheese. Add the vanilla and stevia glycerite and mix until completely incorporated. Sift the Sukrin Melis into the cheese mixture and beat until light and fluffy. In a smaller bowl, whip the heavy cream until stiff. Visually divide the whipped cream into thirds and gently fold each third into the cream cheese mixture. Pour the cream cheese layer into the pan and evenly spread over the crust. Sprinkle the remaining chopped pecans over the top of the cheesecake. Cover and refrigerate overnight. Heat the caramel and hot fudge sauces in the microwave until warm and of a pour-able consistency, stir. Remove the cheesecake from the refrigerator and run a thin, sharp knife around the inside edge of the pan. Grab the parchment paper overhanging the sides and lift the Pecan Turtle Cheesecake out of the pan. This takes a little care and patience. Cut into 16 bars. Drizzle the caramel and hot fudge over each bar before serving. NOTE: I like putting the sauces in a small squeeze bottle to decorate the tops of the bars. Alternately, the sauce can be spooned into plastic bags. Snip the corner of each bag and squeeze the sauces over the bars. Corrected an error found in the crust! Reduced butter from 8 T to 4 T!